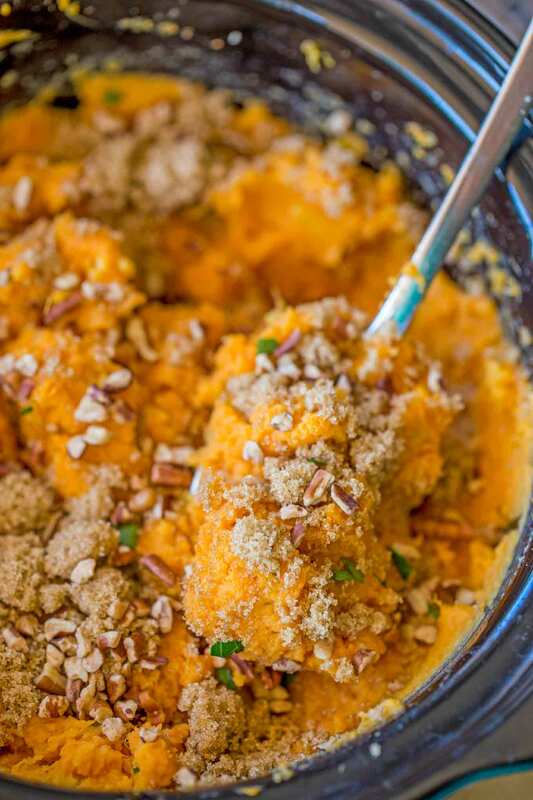 Slow Cooker Sweet Potato Casserole with just a handful of ingredients you’ll have a creamy sweet potato side dish with almost no effort and no oven space used! 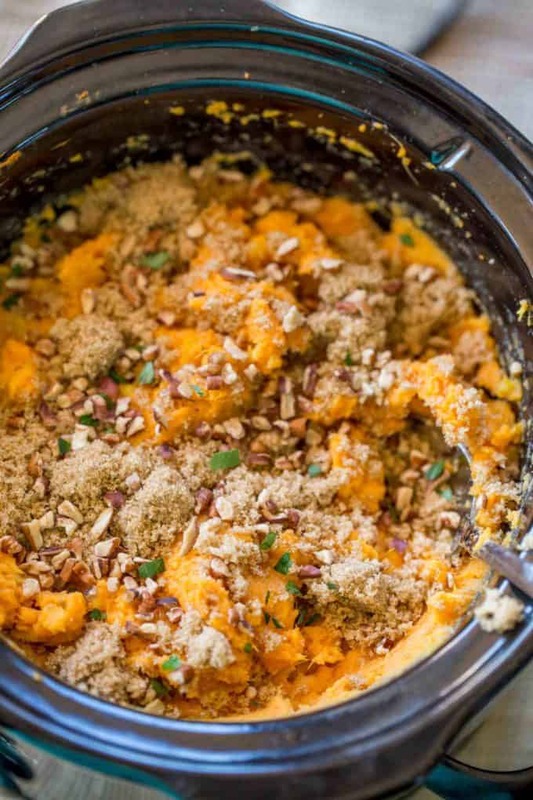 Slow Cooker Sweet Potato Casserole is the PERFECT Thanksgiving side dish. Thanksgiving is a holiday probably more than any other where the oven space is NEVER enough. 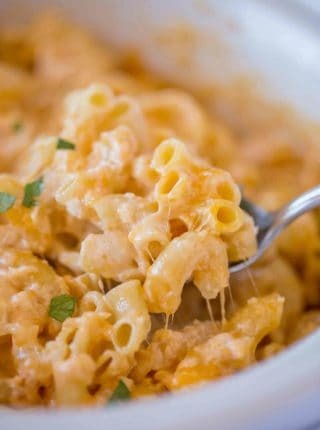 This recipe is made in a slow cooker so inexpensive I would argue it is even less expensive than the dish you’d normally serve your sweet potatoes in. PLUS, it is pretty much entirely hands off. This Sweet Potato Casserole is a set it and forget it dish you can even serve WITHOUT mashing. Yes, thats right, if you want you can cook the chunks, stir once halfway through cooking then just add the topping and serve! 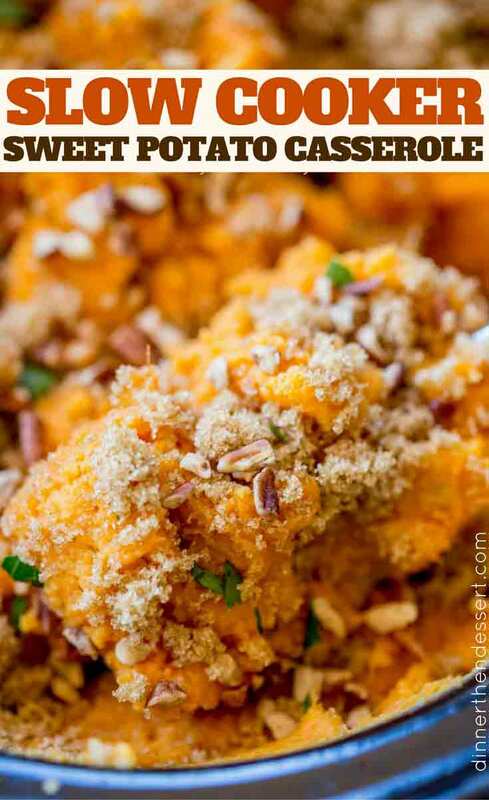 Can you make this dish with canned sweet potatoes? Yes, I suppose you could, but honestly the flavors aren’t going to be anywhere as fresh. PLUS, it is literally peel and chop instead of open the can and strain. No extra cooking time is needed at all. Serve in chunks and skip the puréeing. Top with brown sugar and pecans. Top with a streusel topping – you can use the one in the linked pie above. Top with marshmallows then brown under the broiler for 30 seconds (make sure slow cooker insert can take that heat) or use a small kitchen torch to brown. Using the same ingredients, toss them together in a 9×13 pan and cook at 375 degrees for 35-40 minutes. Top with brown sugar and pecans and serve. And of course when planning your after Thanksgiving back to work lunch, don’t forget about the Turkey Moist Maker Sandwich. Potato Masher: 1/2 whisk, 1/2 potato masher, I love this kitchen tool! Immersion Blender: Make quick work of the sweet potatoes this blender is my go to for blending soups and mashed potatoes. Slow Cooker Sweet Potato Casserole with just a handful of ingredients you'll have a creamy sweet potato side dish with almost no effort and no oven space used! Toss the sweet potatoes with the butter, half the brown sugar, Kosher salt, orange juice and vanilla extract in the slow cooker. Either mash the potatoes or using an immersion blender to smooth the potatoes out. Top with the rest of the brown sugar and pecans and serve. 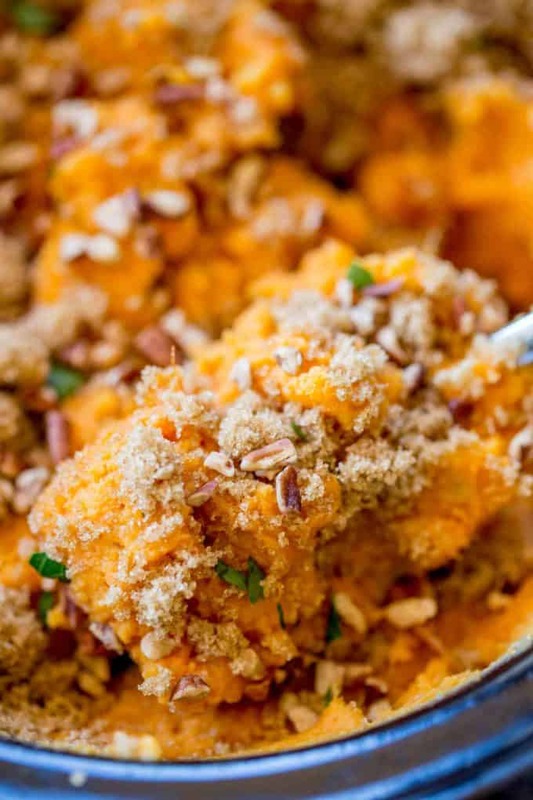 Could you use canned yams instead of sweet potatoes? I have a sweet potato praline recipe that uses canned yams and would like to try something similar in the crockpot to free up oven space. Yay!! Juggling oven time is always one of the biggest stressors of holiday cooking. This looks so tasty delicious, can’t wait to make this for Thanksgiving to. 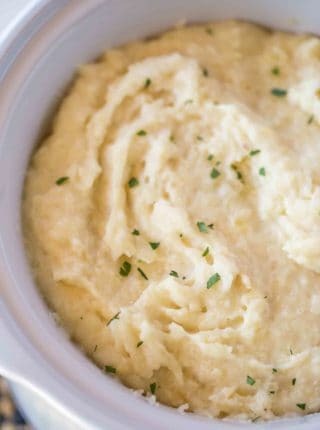 Such a great dish for a Thanksgiving meal! Enjoy!! 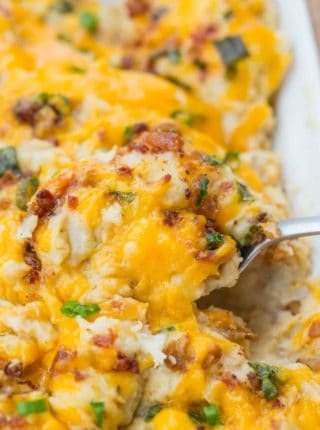 This casserole is calling my name! This is definitely a holiday favorite!!! Definitely and the holidays are coming up fast! Love anything sweet potato! Yummy! Sweet potato casserole is my favorite Thanksgiving side dish!! 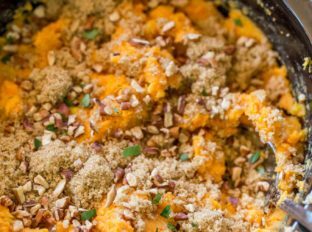 My family is obsessed with sweet potatoes, so they’ll love this version! Love that this is made in the slow cooker! This will be a great side for Thanksgiving! Thanks, Erin! The slow cooker is so helpful especially during the holidays. 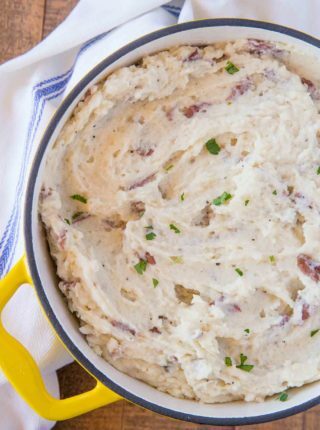 Oh yes…the perfect side dish for the upcoming holidays!